Disney Babies Blog: Babies Blog Hop! I'm honored today to guest-host the Babes in Disneyland Blog Hop, a favorite weekly Disney Blog Hop! Lisa being a mom of 3 and me being a mom of 1, this week's blog hop theme is: babies!! I've heard too many times "what a shame you're taking a baby at his age. He won't remember anything." I'm absolutely okay that he doesn't remember anything; I remember enough for both of us. 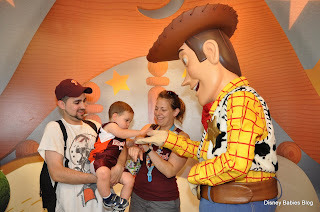 And, I have a lot of photographic evidence that he loved being at the Walt Disney World resort. At home, Noah had a strict 6:30 p.m. bedtime. 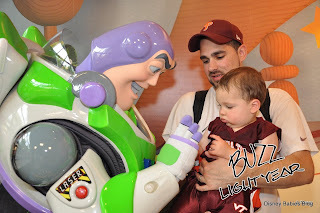 At WDW, he was outside after dark.. and loved it. And how many kids can say they got their "drivers license" and first drove at 18 months old? The list goes on and on. There are too many reasons to count why I love Walt Disney World and why I love sharing it with my son (and husband, and all of you!). I hope you've enjoyed some of these; I'd love to know your thoughts and opinions. Now, make sure to link up your Disney post - baby related, or otherwise, and check out the other bloggers on the way! Make sure you're publicly following both hosts - myself and Babes in Disneyland (we'll follow you back! ), and hopefully you'll find a couple of other great blogs to follow as well. Aw how precious! What a beautiful family you have! Thanks for sharing and hosting this week. Oh, I had no idea this blog hop existed! I am so on board for next week! I have been having the same discussion with my family. 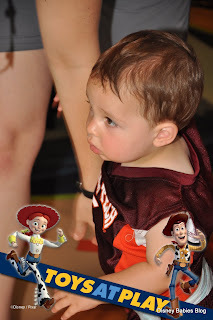 My son, 19MO, loves Mickey Mouse and sings along with the Hot Dog song and dances and I think he would flip out if he saw him there. Your argument "I remember enough for both of us" will be heard by all! I think you are NEVER TOO YOUNG and NEVER TOO OLD for some good old Disney Magic. I've heard a lot of people saying this too that it's a shame you take them with you when they are so young. I don't have children yet but I know for sure that I'm going to take them to Disney and I won't wait until they are "old" enough. I can't even stay away that long haha. Thanks for sharing your wonderful story and cute pictures. I too are asked why I take my son at his age. I totally agree with you that we have had some of the most memorable moments at Disneyland. Taking triplets to Target is probably just as much of a hassle! Except there, you still have to entertain them. I can't imagine multiples, but amazing that you made it work! They're nearing the scary age of 3.. you better take them back before you have to pay! Thank you! Glad you liked the post - love how you phrased that "before they don't believe any more" perfect! Thanks to Jet Blue, flights are dirt cheap.. and we often use our trips to Florida as trips to the grandparents (we've seen them on all 3 WDW trips, though they only came in the parks on this past trip).. and the kicker - I'm active duty Army, so park tickets are dirt cheap. That's the true secret.. if the deals go away, we definitely won't be going as frequently! I totally agree. Take a small child to WDW is amazing! We have 3 kids and they have all gone to Disney as babies. I think taking a child before they don't believe any more is the best possible time to take them. It makes for many magical memories. Great post! Looks like Little Noah is really enjoying growing up at WDW. How have you managed to financially take him so much already? Thank you so much for hosting the blog hop today! The picture of the haircut is so precious! All of the pictures are darling, though! Jenn, the photos are adorable! You're so right! They may not remember it, but you do!! People said it of my two year old, but I don't care. He had a great time in the present, and that's what mattered! Thanks for sharing, and thanks for co-hosting! Such sweetness, Jenn! My youngest was 9 mos. old on our first trip. He may not remember that one, but it sure was fun! I am the mother triplet girls. 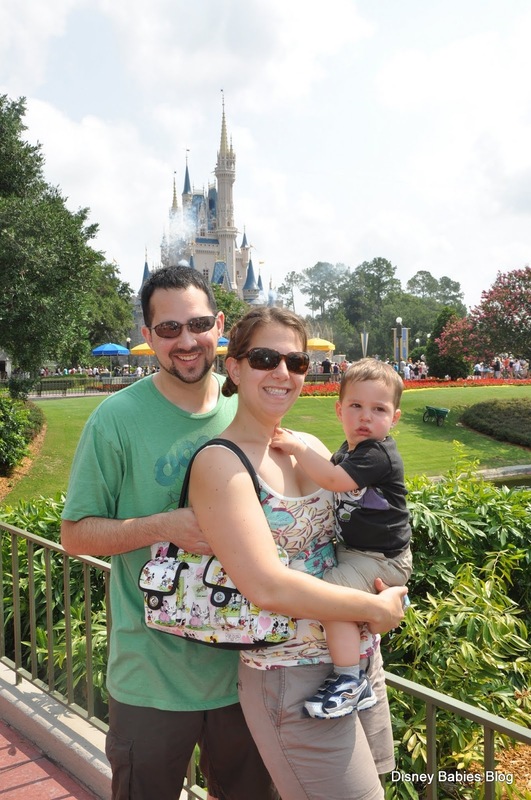 Our first trip to Disney World was a whirlwind adventure. We literally woke up the day after Thanksgiving and made ALL our travel arrangements to be in WDW the following week. Yes Really. I was packing up 23 month old triplets for a 2 1/2 hour flight, their first flight to go on a magical very last minute planned trip. Several people made comments about being crazy (hello I have triplets, that is an obvious statement) and they will never remember the trip. But we had a FABULOUS trip. My girls are 2 1/2 now and they ask daily to see their videos from WDW. I even have video of my oldest Daughter saying Mickey I love you, which is the first time she told anyone she loves them. I have great memories, my girls do reflect back on their videos and we are hoping to go back in the fall for another great vacation. My only regret is I wish we went earlier.